Traveling? Don’t Forget Your Vaccinations! Planning a trip abroad this summer? Whether for business or pleasure, traveling to other countries can be enriching, but not if you come down with a debilitating disease. Well before you take off, make sure you have the necessary, up-to-date immunizations. Getting properly immunized can take 4-6 weeks. So don’t wait until the last minute. That depends on where you’re headed. At least make sure that routine immunizations—measles-mumps-rubella (MMR) vaccine, diphtheria-tetanus-pertussis vaccine, varicella (chickenpox) vaccine, polio vaccine, and your yearly flu shot—are up to date. Beyond that, many countries or regions can present specific dangers. Risks vary also between urban and rural areas. 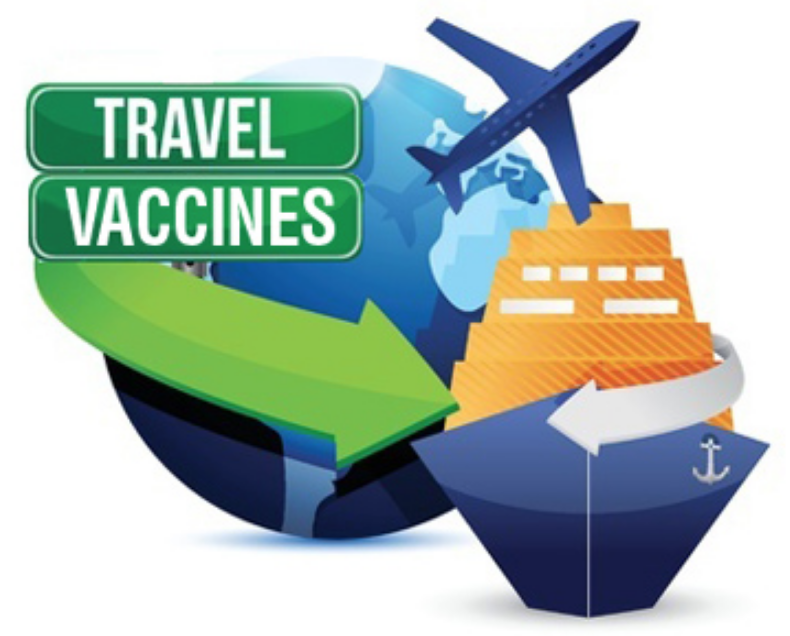 The nature of your activity and where you will travel most of the time should determine which vaccines you need. For example, if you’re traveling to South America or Africa, you should get vaccinated for Hepatitis A, since you can get this disease from contaminated food or water regardless of where you stay. 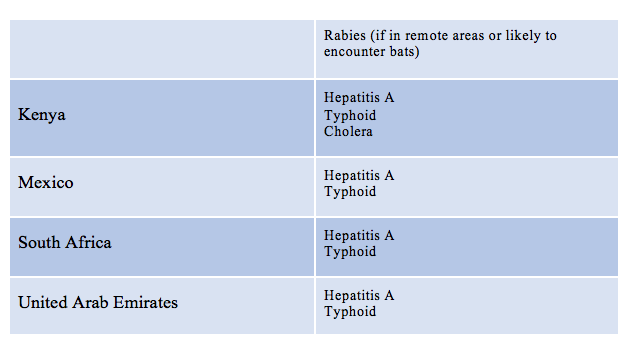 If you venture into rural areas, you should also be immunized against Typhoid and other diseases. Here is a list of a few popular destinations and the specific vaccines as recommended by the Centers for Disease Control and Prevention (CDC). Consult the CDC’s web page for a complete list of destinations and recommended vaccines worldwide. The above list is not meant to be exhaustive. Before traveling, you should consult with your physician or other health care provider to determine which vaccines are right for you and especially your children. An Important Note about Zika: Unfortunately, Zika has become a worldwide epidemic. It is especially risky for pregnant women and their fetuses. It can also lead to other problems in otherwise healthy persons. There is no vaccine to prevent Zika infection, and there is no medication to treat it. It is especially important to prevent Zika infection. That means protecting against mosquito bites that carry the virus. Zika can also be transmitted by sexual relations with infected persons. If you travel to most areas in central and southern Africa, South Asia, the Caribbean, Central America, Mexico, the Pacific Islands, or South America, you should take effective mosquito repellant and wear protective clothing. For more information, visit the CDC’s Zika web page. Even if your vaccinations are all up to date, there are many other things to consider to keep you and your family healthy on your trip. Be sure to discuss with your health care provider any chronic conditions, immune system deficiencies, and medications that might affect your travel. 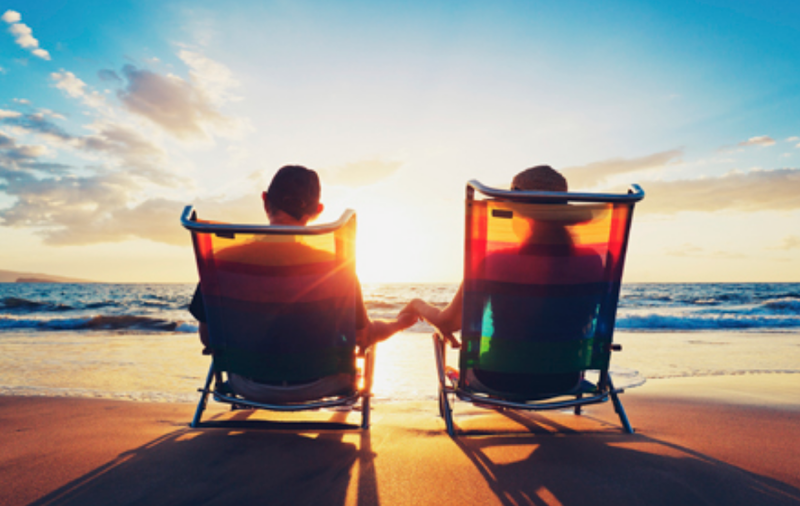 Check with your health insurance carrier about medical coverage while you are abroad. Many plans, including Medicare, do not cover medical expenses, and medical transport back to the U.S. can cost $50,000 or more. Bring copies of all prescriptions that include generic names for medications. If you bring any controlled substances or injectable medications, include a note from your physician on his/her letterhead. If needed, remember your EpiPen. Leave a copy of prescriptions with a trusted relative or friend. Check with an American embassy or consulate in advance to make sure that the country you are visiting will allow you to bring your medications with you. Bring medications for minor ailments. If needed, medication to prevent malaria. A decongestant, with or without an antihistamine. Medicine for pain or fever (acetaminophen, aspirin, ibuprophen). Bandages, gauze, antiseptic, tweezers, scissors, ace bandage, etc. Plan how to handle any special health conditions that affect you or your companions. Watch your health for any symptoms after you return! Before you embark on your international trip, consult a health care provider who is knowledgeable about travel medicine. This is as important as making sure that your passport and other travel documents are in order. At Kathy’s Urgent Care, we think that a travel consultation is important enough to offer it for free. Of course, we will assess a fee for any vaccinations or medications that are required, depending on where you go and what you plan to do. Above all, stay healthy and have a good time! Newer PostThe Sun is Hot! Skin Cancer’s Not!